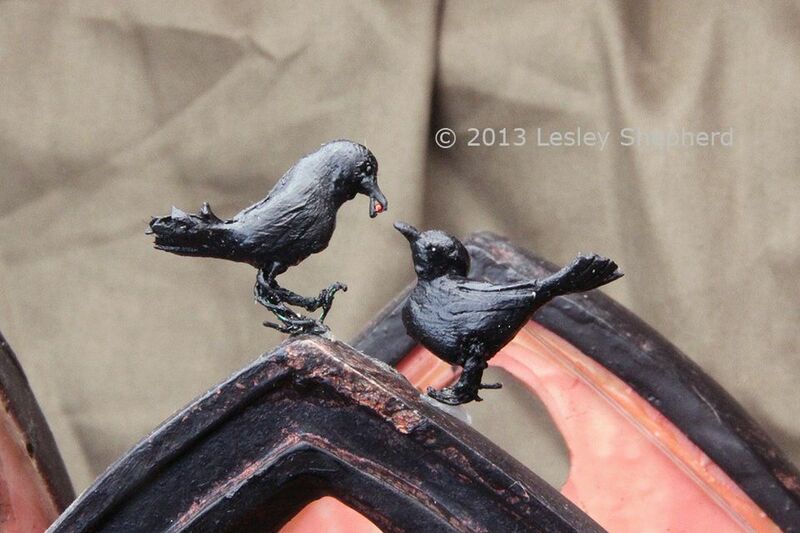 Crows are relatively easy subjects to model in miniature for scale scenes. Their range of natural poses allows them to be perched in trees or set observing parts of your scene. You can model miniature birds from a range of sculpting materials. The crows shown here have been modeled from lightweight air dry clay, which allows them to be realistically perched on thin branches. To begin making your miniature crow or raven you will need to work out the relative size you need for your particular scale. Common crows have a body length of 12 to 21 inches (30 to 52 centimeters) with a wingspan of 36 inches (a little under 1 meter). Ravens have a body length of roughly 25 inches, with a correspondingly larger wing span of up to 39 to 59 inches (1 to 1.5 meters). Work from a photo or model if possible. Good reference photos of crows are available from several birding sites. You should start with a basic standing crow for your first attempt at modeling them in small scales. Once you have experience with wings, beaks and tail feathers, you can adapt your crow models for different poses. Lightweight Air Dry Clay: Use Delight Clay or Martha Stewart Air Dry Crafters Clay (which is similar but slightly more expensive) With their marshmallow like texture, these air dry clays are easily brushed into textured shapes. These light weight air dry clays will need a protective painted coating. Light weight air dry clay is best worked on a piece of glass or tile to keep the clay clean. To prevent the clay from drying out as you work, remove very small amounts of clay from your carefully sealed stash for each stage of the build. Use a soft paint brush to blend the joins between sections. Keep the open package of air dry clay in a resealable bag with the air removed and only take out tiny amounts for each step. The clay can be kept for several years if you occasionally insert a dampened paper towel into your resealable bag. Two Part Epoxy Putty: A favorite of gaming modelers, two part epoxy putty will make miniature birds with a hard finish that withstands handling. It is not quite as easy to texture as is air dry clay. Epoxy putty can be sanded and painted, and like air dry clay you can add sections as you build. As with the air dry clay, only mix small amounts of putty for each step. Blend two part epoxy putty sections together with a bit of water on the surface using modelling tools or a dampened finger. Polymer Clay: Easy to sculpt and blend, you may need to apply a glaze to the feathered sections of an all black bird to differentiate the beak and eyes. Polymer clay is heavy enough to bend small branches, so you may need sturdy perches for birds made from polyclay. Look for good crow reference photos online. As an aid for modeling miniature versions, look at this photo of two crows from the same family. Notice how the birds legs are fairly wide set, and bent forward at the join. The crows have three toes forward and one facing back. At rest, the wings are held above the back, with the feathered tips often showing slightly just above the tail. When bent over the wings and tail may show as separate feather groups. The head is fairly small and is often arched to one side as the crow peers at something of interest. The bill, eyes and feathers are all black, although there can be piebald (black and white) or albino (white) crows. The eyes are very bright and shiny, set just behind the bird's beak. The beak and legs are black, with the beak often having a slight hook in older crows. The beak is usually not as shiny as the bird's feathers. Ravens are larger, heavier birds, with large strong bills. Ravens can have a tuft of feathers showing on their chin or throat beneath their bill. The feet for the miniature crows and ravens are made by twisting sections of fine wire together then folding back the ends of the wire to make the toes. You can make a set of two legs at once by twisting four, 1 1/2 inch (4 centimeters) lengths of wire tightly together. You can use fine beading wire from a spool. 36 gauge wire works well for 1:12 (dollhouse) scale birds. Once you have the lengths of wire evenly twisted along their length, use fine bent nose tweezers or a set of needle nose pliers to separate out the four toes from the ends of the wire. Bend three ends of the wire forward and one back on each foot. Trim the wire toes to shape with end cutters. When you have both feet shaped, cut the twisted sections of wire halfway between the feet to make two separate legs. Insert the legs into a section of floral foam or modeling clay to hold them firmly and paint the wire legs and toes with a good quality black acrylic paint. Tube acrylic paints with their thicker texture are better for painting wire feet than are liquid craft acrylics. If you have black liquid acrylics, mix it with a medium thickness acrylic medium to add body. Set the legs and feet aside to dry thoroughly. To shape the body of your miniature crow or raven, take a small pinch of your modeling material (this example is using lightweight air dry clay) and flatten it into a thin roughly rectangular shape. Don't worry about fingerprints on the clay, they will act as 'texture' for the feathers. While the clay is still damp, use fine scissors to cut into one end of the rectangle the length you want the feathers for your crow's tail. When you have the tail feathers roughly cut out as shown, roll your uncut clay into the shape of a crow or raven body, gathering up the feathers as you roll the clay to form the tail section. Check the body measurements on a ruler to make sure your crow body will be roughly the equivalent of 12 to 21 inches (30 to 52 centimeters) in your chosen scale. When you have the body shaped in a slightly rounded curve as shown, set it aside to dry. You can fit a toothpick into the base of the body where one of the legs will go, and set the toothpick in modeling clay until the body dries. Note: If you are using epoxy putty, make sure to make two small holes in the bird's body to insert the legs, or see step 8 and insert the legs before you allow the epoxy putty to harden fully. To make the wings for a miniature crow or raven, flatten another section of your modeling material. If possible, allow it to harden slightly. When the material is 'leather dry,' pliable but set (if you are using air dry clay), cut out small semi circles from the material as shown, using fine scissors to cut wing feathers on one side that are longest at the top of the semi circle. Check the size of the wings against the crow or raven's body. The wings should span the body from just below the neck at t shoulder, to just above the tail, covering the base of the tail. If you wish, you can paint your modeling material when the wings have been cut. Cut two wings with feathers running in opposite directions, one for each side of the body. When the wings are the correct shape, lay them over the body of the crow you made in the previous step and trim them to shape or size if necessary. If you are using air dry clay, moisten the body of the crow or raven with a damp brush and gently press the wing to the body. As the damp clay dries it will stick together. If you are using epoxy putty, use a bit of soft putty to hold the wings in place on the body. You can texture any soft putty which shows along the edge of the wings. If you are using polymer clay, gently blend the wings into the body of the crow or raven at the shoulder and along the lower edge of the wing. Blend the upper edge of the wing into the crow's center back. To shape the head of a miniature crow or raven, roll a small ball of your air dry clay, epoxy putty, or polymer clay. Check the size of the head against the body of the bird, and reduce the size until it is roughly the correct proportions. Using bent nose tweezers or a set of needle nose pliers, gently pull out the beak from one side of your head ball as shown. If you pinch off too much, you can cut it to the correct length with sharp scissors. Use a damp brush (for epoxy putty or air dry clay) to gently smooth the beak into the correct curve coming off the head. To add fine detail, you can use a pair of fine scissors or a craft knife to cut through the beak to shape the beak so it can hold objects. To finish the assembly of your model crow or raven, bend the legs in a sharp angle and insert them so the bent 'knee' faces backwards toward the bird's tail. You can use a small bit of clay gently inserted around the top of the leg to hold the legs in the body. PVA glue can also be used to help hold the legs in place. If you are using epoxy putty you should insert the legs before allowing the body shape to dry. Use a damp brush to soften the neck end of the crow or raven's body, and set the head on the body. If you are using epoxy putty, use a bit of soft putty to hold the head in place and blend it to shape to merge the bird's body and head. If you are using air dry clay, set a bit of soft clay on a smooth surface and blend it gently with a damp brush to turn it into a paste. Apply the "paste" to the neck join and blend the head into the body. Set the head into the pose you want your finished bird to hold. For polymer clay birds, use an artist's brush or an embossing tool or rounded toothpick, to blend the head into the body at the neck. I used small no hole beads or microbeads for the eyes of my crow, but you can make eyes from tiny balls of polymer clay if you wish, or shape the eyes on the side of the head with a fine modeling tool and detail them with gloss paint when you paint your bird. Check that your bird will hold its standing position, adjusting the feet if necessary. Set the bird aside to dry or harden. Finish your scale miniature crow or raven by painting the body and all feather shapes with a gloss or semi gloss black acrylic paint. If you are using epoxy putty to model your bird, you may prefer to use enamel paints. Use a fine brush and make sure you get paint into the base of any 'loose' tail or wing feathers. The beak of the crow or raven should be painted with a flat rather than gloss black to add contrast. If you have made your crow from polymer clay, apply a gloss varnish to the feathered areas of the miniature crow or raven, leaving the beak and feet free of varnish. Have fun making these miniature birds, they are great for Halloween scenes, fields, or as unusual pets or garden visitors.